This was written by Henry O. Kulisch, Jr. for last years Essay Contest. Now is the time to start writing for this years contest. 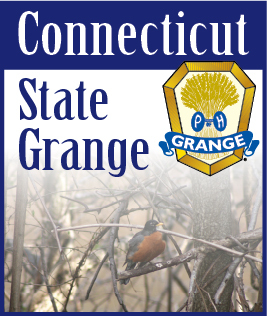 In 50 words or less tell us “Why I joined the Grange...” The deadline is October 1st, but it’s never too early to enter. Carl and I had a nice trip through rural Maine. We took 95 and 295 north to Augusta and then headed inland to Farmington, Maine, where this years North East Lecturers Conference will be held. The drive through the gently rolling countryside was like a trip back in time. We passed farms, grazing horses, ponds, woodlands, hills and meadows. And the last week in April when we were there, there was still snow along the sides of the road where it had been plowed and in the woods under the trees where the sun doesn’t reach. The campus of the college reminded me of UConn in the 50’s. Farmington is a small town (we ended up on some dirt roads trying to find our way back when we went too far) but, it had a Dunkin’ Donuts, McDonalds, Subway, a few pizza shops and we found 3 hotels within three or four miles of the campus. There is also what is billed as one of the best ice cream shops near the campus. I hope a lot of you will find your way to Maine for the Conference. It is well worth the trip. LET’S CELEBRATE all that is good about the Grange. Grab a friend, neighbor or relative who is a non-member and bring them to Good Will Grange Hall on Saturday, July 26th. Entries for our Photo Contest should be brought to the hall between 9:00 and 10:00 a.m. or they may be mailed to me in advance. At 2:00 p.m. the program will begin. The Connecticut Bristol Old Tyme Fiddlers will be the featured entertainment. Even if you don’t have any entries, we hope that you will be able to join us to enjoy their performance.